No host nation has ever failed to make it out of the group stages. But South Africa's fans must be concerned that Bafana Bafana (The Boys) could be the first to fall: They've not progressed from the opening round during their two previous appearances to date, when their team was comparatively stronger than it is today. 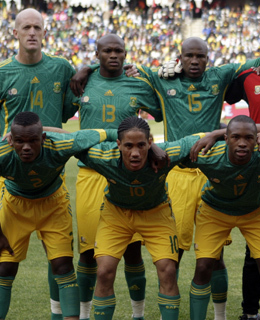 South Africa failed to qualify for World Cup 2006 or even for this year's African Cup of Nations. As hosts, they were automatically qualified for this year's tournament, but their form in recent matches has been generally disappointing, with the team struggling to score goals. The fact that they reached the semi-final of last year's Confederations Cup on home turf may give some cause for optimism. Coach Carlos Alberto Parreira won the World Cup in 1994 as coach of his native Brazil, a job he also undertook in 2006. Working with a far more limited talent pool in South Africa, he'll hope to harness the voices  and vuvuzelas  of the Rainbow Nation's fanatical fanbase to inspire the team. Its best players include midfielder Steven Pienaar, defensive hard-man and captain, Aaron "the Axe" Mokoena, both of whom play in the English Premier League (though Parreira surprisingly omitted the EPL striker Benni McCarthy), and also Matthew Booth, a tough-tackling defender with local side Mamelodi Sundowns. But just getting out of the group will feel akin to winning the entire tournament. Player to watch: Coming off the back of a stellar season with Everton, Steven Pienaar provides the crucial link between midfield and attack.